Gurdas Maan is an Indian Punjabi singer, songwriter & actor. He considered one of the most notable figures in a world of Punjabi music. Received the title of Punjab Ratan by the then honorable PRIME MINISTER Mr. I. K. Gujral in 1997. He received the Phalke award by the Dadasaheb Phalke academy in 2012. Awarded the honorary doctorate is Punjabi literature by the Punjab University for his contribution to Punjab literature through his songs in 2013. Sells out the Wembley arena during his concert tour to England in 2013. He was born in Giddarbaha village of the Indian state of Punjab and gained national attention in 1980 with the song "Dil Da Mamla Hai." Since then, he has gone on to record over 34 albums and has written over 305 songs. Crestwood indAus Care is proud to present you the legend live in Sydney. 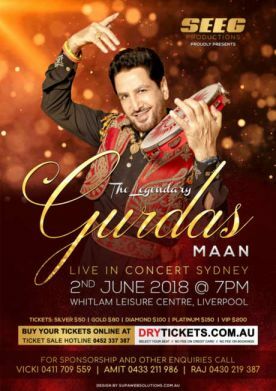 Tags: Gurdas Mann, Living Legend, Sydney Punjabi Concert, Australia Tour.